Hartsfield-Jackson Atlanta Intl. - Ngurah Rai Intl. O'Hare Intl. - Ngurah Rai Intl. John F. Kennedy Intl. - Ngurah Rai Intl. All prepared for your next unforgettable adventure? Ensure you don't miss out on any fun in Jimbaran by knowing some details about it before you hurry off. If you need help getting your bearings, the national capital, Jakarta, is 600 miles (966 kilometers) to the west. Also, Kuta is 3 miles (5 kilometers) to the north. The population of this area of Bali is roughly 2,000. 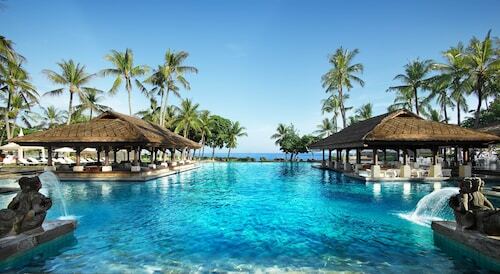 Get significant savings on Travelocity's Jimbaran accommodation and flight deals. You've also got a world of choice with upwards of 400 airline partners and 665,000 properties. From airfares and accommodations to rental cars and activities, you've got the added security of 24/7 personal assistance via our Customer 1st Guarantee. If you somehow discover a cheaper deal on a different website, we will reimburse the difference^. Everyone knows that unforeseen situations can arise. If you ever have to cancel your travel reservations, you will never incur a fee from us. And so long as you get in quick, many accommodations won't charge you a fee either^. 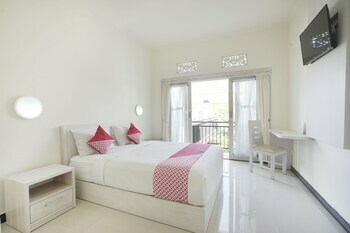 With 1,045 wonderful properties in Jimbaran, your options are many and varied. But don't wait around. The sooner you book, the sooner you can start looking forward to your adventure! Your vacation is here! It's the perfect time to indulge in life's little luxuries. Make a reservation at The Villas at AYANA Resort, BALI (Karang Mas Estate) or the Bulgari Resort Bali (Jalan Goa Lempeh, Banjar Dinas Kangin) and enjoy outstanding service and a decadent room. 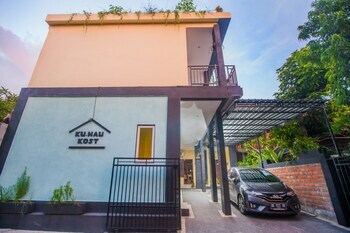 The Samaya Seminyak (Jalan Laksmana, Seminyak Beach) and the C151 Smart Villas at Seminyak (Kayu Aya Street no.151) are some less expensive options if you'd prefer to spend your money on experiences. Where do you fly into for Jimbaran? Put on your headphones and pick an in-flight movie. Before you know it, you'll hit the tarmac at Ngurah Rai International Airport (DPS). 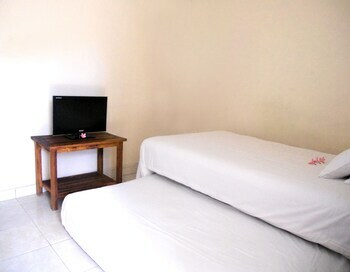 It's 2 miles (3 kilometers) to the north from the middle of Jimbaran. Can I rent a car in Jimbaran? 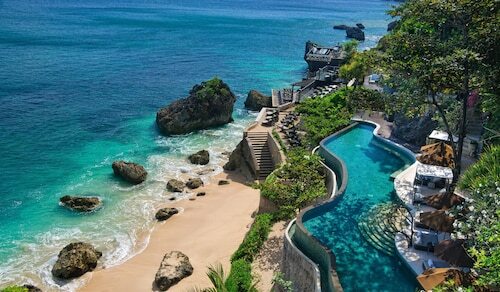 Airfares to Jimbaran? Check. The ultimate road trip playlist? Check. Now the only thing left is to select a ride via Travelocity. You'll be driving down the highway in no time at all! Unfortunately, there are no car rental agencies in easy reach of Ngurah Rai International Airport. You'll need to catch a cab or look into pubic transport if you want travel the 2 miles (3 kilometers) into town. You really can't stay in Jimbaran without swinging by Kuta Beach. This world-renowned attraction draws in crowds of travelers year after year. 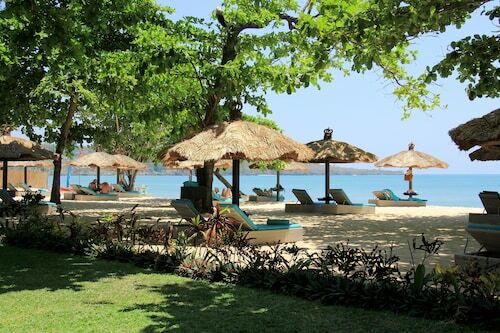 Travelers will want to check out Nusa Dua Beach and Tuban Beach. After more things to see in this buzzing city? Legian Beach and Seminyak Square will keep you occupied. So you've seen all the cool attractions on the mainland. What's next? Maybe now's the time to journey across the water and find out what's on Moon Cot Sari Turtle Farm. Like some more options? Discovery Shopping Mall is the perfect place to go if you're craving some window-shopping. With crowds of people bustling in and out, you'll have plenty of fellow shopaholics to keep you company! But there's more. Don't forget to pack your bathing suit! No matter if you prefer thrilling rides, chilling down lazy rivers or splashing in paddling pools, Waterbom Park is a fabulous day out for everybody. So you've stepped off the plane in a new destination — what's next you ask? Why not bide your time and see what brand new experiences and unforgettable adventures blow your way? After all, isn't that what travel's about? Jimbaran has plenty of things to see and do, but if you're wanting to see more of the region, you're in luck! You have internationally celebrated tourist attractions just a stone's throw from here! 16 miles (26 kilometers) away is Tabanan. Many travelers use this locality as a base to experience the world-famous attraction, Tanah Lot. 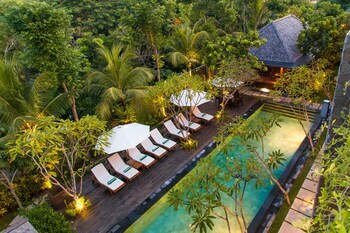 Nestled on the beach, this Jimbaran Bay resort is within 1 mi (2 km) of Samasta Lifestyle Village and Jimbaran Beach. Garuda Wisnu Kencana Cultural Park is 2.8 mi (4.5 km) away. This family-friendly Jimbaran resort is located near the airport, within 3 mi (5 km) of Samasta Lifestyle Village and Jimbaran Beach. Udayana University is 3.1 mi (4.9 km) away. Offering direct access to the beach, this Jimbaran Bay hotel is within 3 mi (5 km) of Jimbaran Beach and Garuda Wisnu Kencana Cultural Park. 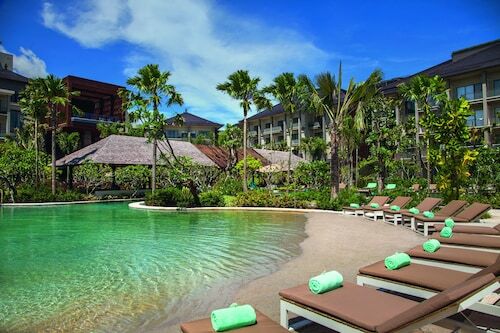 Bali Collection Shopping Centre and Kuta Beach are also within 6 mi (10 km). 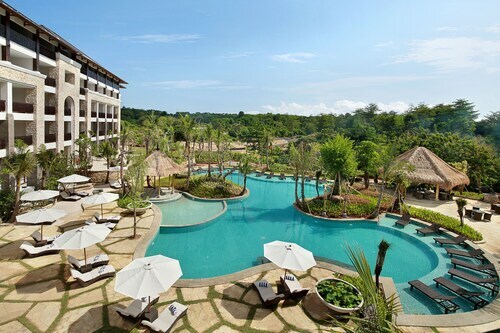 This family-friendly Jimbaran resort is located by the ocean, within 3 mi (5 km) of Samasta Lifestyle Village and Garuda Wisnu Kencana Cultural Park. 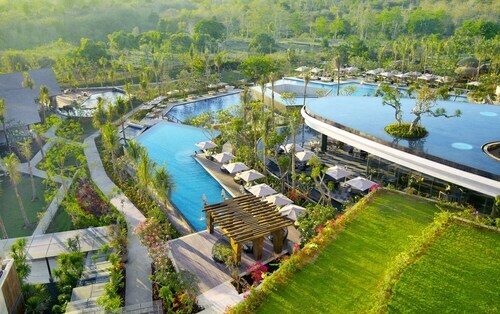 Bali Nusa Dua Convention Centre and Bali International Convention Center are also within 6 mi (10 km). 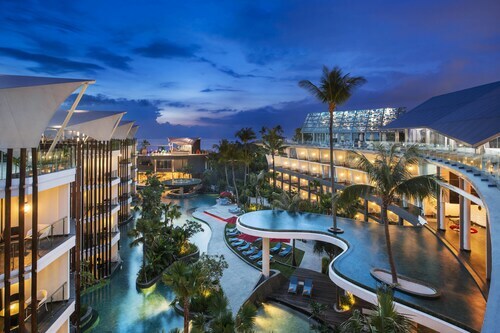 This family-friendly Jimbaran hotel is located in Bukit, within 3 mi (5 km) of Jimbaran Beach, Balangan Beach, and Garuda Wisnu Kencana Cultural Park. Samasta Lifestyle Village and Udayana University are also within 3 mi (5 km). 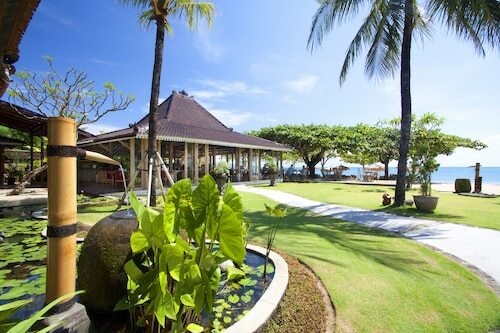 Nestled on the beach, this Jimbaran Bay resort is within 1 mi (2 km) of Jimbaran Beach, Honorary Consulate of Italy, and Kedonganan Fishing Pier. Benoa Square and Samasta Lifestyle Village are also within 2 mi (3 km). Nestled on the beach, this Jimbaran Bay hotel is within 2 mi (3 km) of Jimbaran Beach, Benoa Square, and Samasta Lifestyle Village. Jenggala Factory and Garuda Wisnu Kencana Cultural Park are also within 6 mi (10 km).